Crobox AI: How does it work? Artificial Intelligence. What once was an idea only shown to the public eye in Sci-Fi thrillers, has now become a household term. Although many outside of the tech industry may still see AI as a superhuman that will lead to the end of human civilization as we know it, the reality of the technology is not quite as grim. However, when it comes to AI in the tech space, there's a lot of clutter. It seems every company is now using AI in some shape or form... Or so they claim. With all these messages being thrown from every direction, a lot is left unclear. So, when we began to receive an influx of questions regarding our AI, it made sense. We want to make sure that everything we do is brought down to a more understandable, human level. There's a little saying here at Crobox, "Sometimes you need to slow down in order to speed up." That's exactly what we're going to do in this post. Before we get into how our technology uses AI to optimize eCommerce webshops, let's quickly cover the basics. A question we often come across is: What's the difference between Artificial Intelligence and Machine Learning? In its most simple terms, machine learning is the algorithm AI uses to make its predictions. Artificial intelligence is made up of two key aspects: knowledge and machine learning. So, when creating AI technology, the first step is to provide the system with as much knowledge about a specific subject as possible. Then, using machine learning algorithms the system will "train" itself by learning from the patterns found in the knowledge it was given. Eventually, the algorithms will be trained to make predictions accurately or at least at a statistical significance. Moving forward, the system will continue to acquire new knowledge from the actions it observes. And with this increased level of knowledge, the level of accuracy (should) rise. 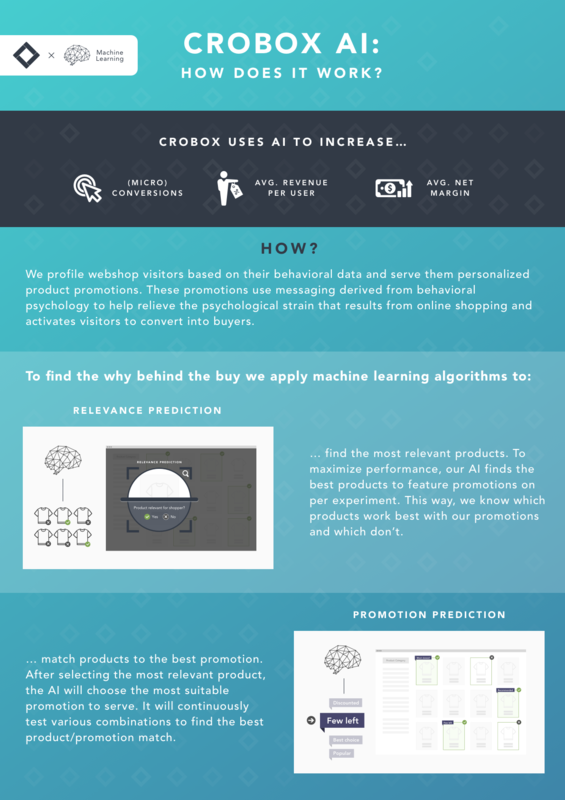 At Crobox, the knowledge our AI is fed comes from the contextual data of a webshop. During its exploratory stage, it will gather this knowledge from webshop visitors until it has enough data to reach an acceptable significance (p < .05) and power (power > .80) rate. Then, machine learning algorithms are used to learn from the knowledge so the AI can a) find the right products to show promotions on and b) serve the right promotion. We recently sat down with Magnus Unemyr to discuss how Crobox uses AI and our thoughts on the matter in more detail. If you're looking for more information, check out this article. For more information on how our technology helps eCommerce brands optimize their site and gain valuable customer intelligence, download our white paper!